Light therapy can be an effective treatment for mood disorders, suggesting that light is able to affect mood state in the long term. 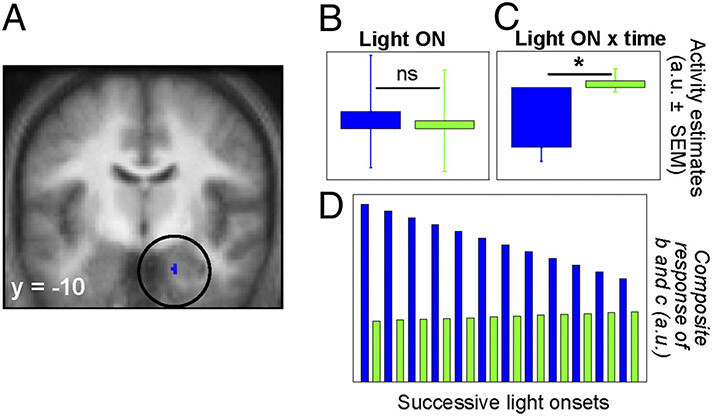 As a first step to understanding this effect, we hypothesized that light might also acutely influence emotion and tested whether short exposures to light modulate emotional brain responses. During functional magnetic resonance imaging, 17 healthy volunteers listened to emotional and neutral vocal stimuli while being exposed to alternating 40-s periods of blue or green ambient light. Blue (relative to green) light increased responses to emotional stimuli in the voice area of the temporal cortex and in the hippocampus.